The drawing is detailed, dramatic and disgusting. Called The Jew, Universal Enemy, it shows Christ on the cross and churches in flames, overseen by a sinister, red-lipped, voracious face. Philipp Rupprecht, better known as Fips, composed this caricature for the notorious Nazi newspaper Der Stürmer in 1937. He also illustrated a 1938 children’s book Der Giftpilz (The Poisonous Mushroom), intended to educate young Germans about the Jewish menace. Rupprecht was sentenced to 10 years hard labour after the war. 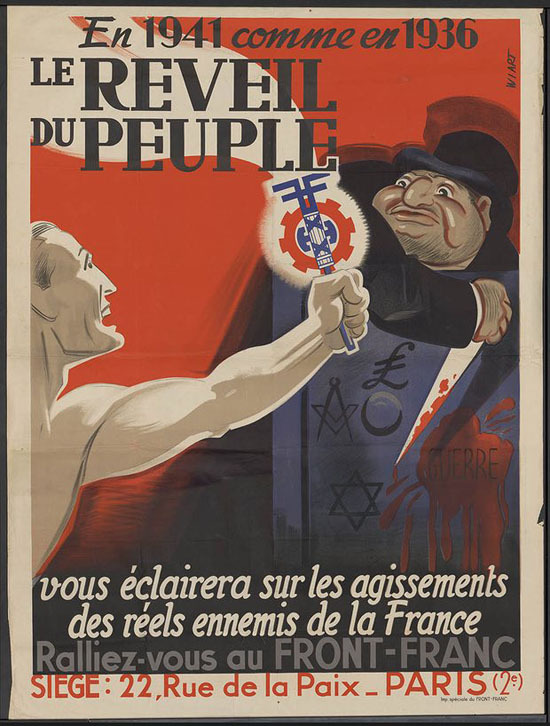 His work is among 150 pieces of antisemitic propaganda – posters, drawings and objects – on show at the Caen-Normandy Memorial Museum, in an exhibition called Heinous Cartoons 1886-1945: The Antisemitic Corrosion in Europe. They depict sinister, red-faced, obese capitalists smoking cigars on the backs of oppressed workers. They show grotesque communists clamping chains on a suffering Aryan. They portray Jews as rats and vermin. As the dates in the title suggest, the exhibition chronicles how anti-semitism grew at the end of the 19th century and reached a horrible culmination in the Holocaust. The works all come from private collection of Arthur Langerman, a Holocaust survivor. Born in Antwerp in 1942, at the age of two he was placed in an orphanage by the SS after his father and mother were sent to Auschwitz. Although his father perished, his mother survived and recovered her son, but never spoke to him about her wartime suffering. Langerman went on to found a successful diamond dealership, specialising in coloured gems. The trial of Adolf Eichmann in 1961 jolted him awake to the horrors of the Holocaust. Fascinated, and finding a strong desire to understand, he began collecting antisemitic objects. Today, he has assembled some 7,000 pieces, including postcards, posters and paintings, not to mention dozens of wooden figurines from Strasbourg. At the end of the 19th century, these intricately carved images of grotesquely bearded, disfigured representations of Jewish peddlers and rabbis were popular in eastern France – an example of how hatred of Jews had for centuries pervaded western art, politics and popular culture, from fine arts and crafts for the elite to everyday toys and knick-knacks. “The collecting has became an obsession,” says Langerman, who says its purpose is “to illustrate various forms of hatred”. The exhibition is in three parts. It begins with the 1886 publication of Edouard Drumont’s publication of the antisemitic tract La France Juive (Jewish France) and the Dreyfus affair. The second section looks at the interwar period, 1918-33, and the third Nazism. While some objects are included, the focus is on postcards and posters. Among the most devious are Czech artist Karel Relink’s drawings, spread across 33 postcards, that misinterpret sayings from Talmud to deride Jewish traditions and rituals. The posters are more powerful. In one unsettling image, a black saxophonist sports a Star of David under the title Degenerate Music. In one work from Serbia, a white bearded Jew stares over a balance, with coins and banknotes in one side against trapped Yugoslav soldier in the other. A creepy poster from occupied Russia in 1942 shows an evil-looking Jew dressed up as a communist in red pyjamas striding over a pile of human skulls. Given the deplorable nature of their message, can any of these works really be called art? Yes, says Langerman. Many of the artists, such as Rupprecht, demonstrate a talent for creating strong, powerful images, he says. Rupprecht’s paintings show technical finesse, while Relink’s pastoral impressionist-like scenes continue to be sold at prestigious auctions. But Stéphane Grimaldi, the museum’s director general, disagrees. “These are historical documents,” he says, “they have no artistic value. They’re everything art isn’t.” He refused to put any paintings on display, preferring to focus instead on the graphic propaganda. Many historians agree with Grimaldi’s assessment. Steven Baum, editor of the Journal for the Study of Antisemitism, calls the collection “a gem and guidepost into understanding the transmission of hate”. Until now, Langerman’s collection has largely remained out of sight, tucked away in his Brussels home. Museums generally only showed works as parts of larger exhibitions, such as the US Holocaust Memorial Museum’s show on Nazi propaganda titled State of Deception. Now touring Europe, it arrives this month at Les Milles memorial outside Aix-en-Provence. This article was amended on 27 March 2017. An earlier version of a picture caption said the words on a poster were in Czech; they are in Polish.